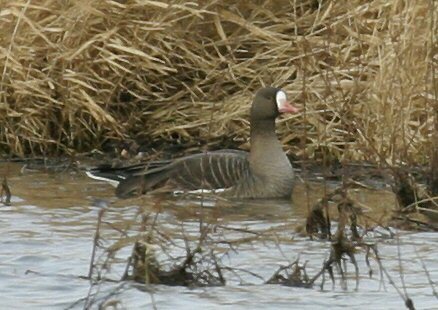 The smallest "grey goose", like White-fronted Goose, with pink bill and orange legs but the white on the adult's forehead extends much further towards the crown. The prominent yellow eye ring is diagnostic. It is not much bigger than a Mallard and is closely related to the larger, more common, White-fronted Goose. Breeds in Arctic Eurasia and winters in southern Europe.